OUR PRICE: $28.00 - Join Rewards Get $2 Dance Dollars On This Item! Grishko's Ultimate split-sole canvas shoe features a strikingly flat suede sole at the forefoot for ultimate balance, and a light cushion in the heel sole for shock absorption. These slippers mold beautifully to the foot, in soft and durable canvas with just the right amount of stretch. Medium-height V-shaped vamp; elastic drawstring; elastics pre-sewn at sides of heel. Returning to ballet after 7 years I debated over what slippers to buy. I had an idea of what I liked in a shoe from my previous dance experience but even then I struggled to find a slipper I was completely satisfied with. The closest I came to finding something I really liked in my previous experience was Sansha's Pro Split Sole slippers, but even then I had my issues with the shoes either being too narrow or too wide. I decided to try the Ultimate by Grishko this time around after years of Sansha, Capezio and Bloch. I debated over what size to get after reading some previous reviews of others saying the shoe runs small and to size up. I decided against sizing up and followed the suggested fitting by ordering my normal street shoe size and I am glad I did. I wear a size 7 in street shoes and I ordered a 7C and they fit perfectly. After sewing my elastics in place I did not even feel the need to tighten my drawstrings at all, a perfect fit. I adore the slight cushion in the heels. I have very hyperextended knees and it makes all the difference in jumping and landing for me. When the pair I have now wear out, I will definitely be purchasing these again! I absolutely love these shoes! They really bring out my arch and the soles make me turn very well (I think its because it makes more friction, but I'm not too sure). The only problem is that the shoe fits kind of weirdly at the toes (that also might be because I ordered them too small), but other than that they're great. These run small. I ordered two pair, one in size 9 and one in size 5 for my two dancers. They could not get them on their feet. The sizing guide needs to indicate that they run small. After reading all the reviews I was hopeful I finally found the perfect slipper. These just don't work on my feet. They are too bulky - too much fabric and don't form to my arch. The sides come up to high. Once the elastics are criss-crossed there's barely visible skin left. Sadly I can't return them as I used the elastic trying to get a better fit and they won't relax again. I have high arches and Egyptian shaped feet for reference. I wear a US size 7.5 street shoe and have slightly wide feet. I ordered a size 7.5 C which I found to be both slightly small and narrow. I am exchanging them for a 8.0 D. The shoes appear to be well made, constructed from good quality material and have a flattering fit. I wear a street shoe size 6.5, so I ordered a 7 after reading all the reviews here - and they're a little too big. Order your street shoe size! They're only slightly too large so I wore them anyways and they're great. They make my arch look amazing. They're really flat, unlike Sansha where there's a lot of material under your foot. I'm definitely ordering these again. I've ordered these shoes before, but I have no idea what I ordered in the B, C, D, column. I need to order these again and I don't know what B, C, D stands for...... HELP? On the other side of things, these shoes make my arch look fabulous, and I'm pretty flat footed. They lasted me almost 6 months before the toes started to wear holes into them (which is GREAT for me, b/c I dance 3-5 hours a day and spend between 4-6 hours a week in these slippers. Sometimes longer.). These are my favorite ballet slippers I've had yet, and I've tried ALOT of brands. LOVE these. Nearly identical to the Sansha split sole ballet slipper on all fronts - color, material - except the Grishko version does a much better job with making the suede padding fall flush with the rest of the slipper. It doesn't feel like you're standing on a wad of paper towels like the Sashas. As far as sizing, I'm a 9M street shoe (more rare that I buy a 8.5M) and I found they ran just slightly on the large side. 9C was too large and 8.5C fit just enough without being too restrictive. I love these slippers. I previously wore Sansha split soles, but switched to these about 5 years ago. Much more comfortable and more flattering on my feet. I wear a size 8 street shoe and have wider feet with low arches and these are the most flattering soft shoes I've worn. I thinks it's the "V" vamp makes the difference. Ignore the sizing chart!!! My daughter would have been a size 3 by the chart, I ordered the smallest size available, which is a 4 and it was way too small. I've now ordered the 5 and am hoping it works. Theyre great shoes, but they are kind of thick in the material. Usually ballet shoes are thinner and lighter but these are a little thicker, not a big deal. The color of them are really pretty and they match the color of the tights so its all one line and thats really pretty. These dont come pre sewn, so know how to sew elastic before you buy these, you dont want to mess up on 25$ shoes! The sizing is a little off, you want to order a full size up. My street size is 7.5 and i ordered a 7.5 C and the width was okay but the length needed to be a bit bigger. These run narrow so order up a width too if you have medium to wide feet! I LOVE THESE SLIPPERS. I have gone through several pairs of slippers in the past few months trying to find the best possible slippers for class. I'm older and I need the most comfort and support available and these definitely fit the bill. I have tapered toes, which typically do not look great in canvas flats, but these FIT. LIKE. A. GLOVE. They look glorious across the front of the shoe and the arch. They are a smidge baggy in the heel but I have very narrow heels considering how my feet are rather wide-ish. I wear an 8.5-9 in street shoes, 9D in Capezio flats, and 6.5C in Bloch flats. I ordered a 9C and a 9D and the 9D was perfect. These are a lovely light pink that blend perfectly with my pink tights, and the extra little padding in the heel is magic. You don't realize you need it until you have it and are like, "wow!" The lining in the front of the shoe is seamless so it makes pirouettes and balances so much easier, there is no bunching of material that gets in the way. Win, win, win, win for these flats. I will order them forever. I really like these shoes, but the sizing is tough to figure. I normally wear a size 5 in dance shoes, but based on other people's remarks I bought a 5.5, which were still a smidge too small They didn't stretch, as I had expected, so I switched up to a size 6, but these were much too big. Great shoe, but RUNS SMALL! I just ordered these for my daughter (9) and went with the street shoe size child/adult comparison chart. She measures a 2.5 on a shoe measuring thingamabob, so I ordered a 4.5 --WAY TOO SMALL! Couldn't even get them on her feet. I compared them to a Bloch split sole canvas ballet shoe of the same size (4.5) and they were about a half-size smaller than the Bloch shoe. Her converse tennis shoes are a bit big at size 3, so I exchanged them for a 5.5 hoping that will do the trick--big enough that she won't grow out of them by performance time in a few months! I would suggest when ordering these shoes for girls, take the best street shoe size, convert it to women's size, and bump up a half size. We have tried almost every ballet slipper. My daughter has a high instep and arch, wide foot and narrow heels. We have had the worst time finding a shoe that fits well! One of the salespeople (at your retail store) recommended trying the Grishko Ultimate. The shoe fits well, and has held up quite well. Most ballet slippers look "bunchy" on her foot, but the Grishko did not! As mentioned here, they do get a bit dirty, but they are canvas. It is nice that the shoes do come in wider widths. We are very pleased with this shoe!! I was required to buy canvas slippers for class and I was having a pretty hard time choosing a brand. After going back and forth between these and the Bloch Pump (I have used the leather before), I am so glad that I chose the Grishko slippers! 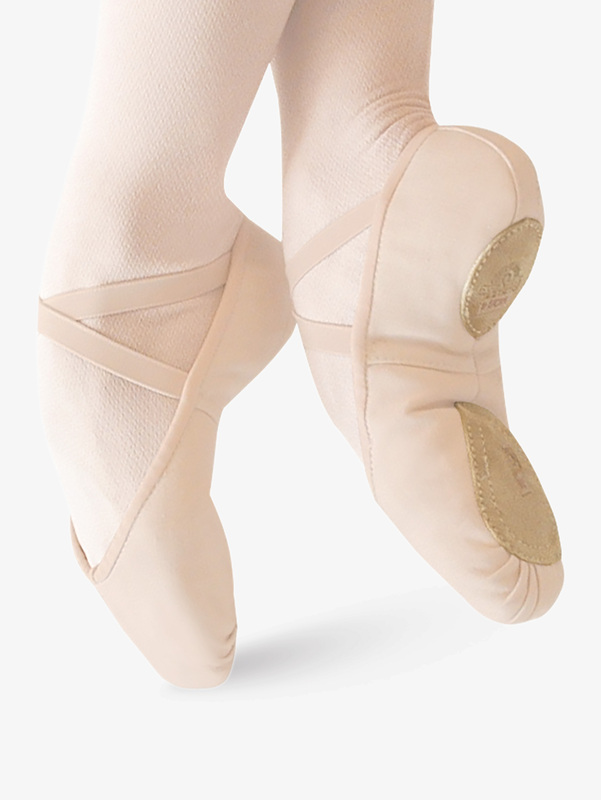 They are a beatiful light pink/white color, they flatter my flat feet, and they allow me to dance with just enough grip to be able to turn and balance. These shoes have indeed molded to my feet, as the description says. I wear sizes 8.0-9.0, depending on the shoe. I believe I got an 8.5 width B or C. They fit perfectly! I would have to say that the only con to this shoe is that they get dirty rather quickly, but when mine wear out... I will definitely buy another pair! I have returned to ballet after 25 years- and the selection of shoes is dizzying! I had always danced in leather, and so of course went back to leather. I've been curious about canvas though. This is now the third brand I've tried- I hated the others- lumpy forefoot soles and not flattering on my tapered foot. Grisko Ultimate has changed my opinion about canvas shoes. The forefoot is so flat, and my balance is better in these shoes than any other- I can really feel the floor. The slight heel padding is a nice touch. The canvas is a tighter weave than the other two shoes I have- I expect they will last a long time. Some here have complained this shoe doesn't look good on a tapered foot- this shoe looks beautiful on my tapered Greek foot, better than most of the other shoes I've tried. I wear a size 6 in dress shoes and sandals, so ordered a size 6.0 B and 6.5 B, the 6.0 B was slightly tight on the big toe, but fit everywhere else, the 6.5 B was looser in the big toes, but fabric bunched too much in the heel and other toes- I kept the 6.0 B. After wearing a few times, the big toes have stretched out. I still have a love for leather though, and was happy to find the Grishko Ultimate leather at another store- so now I have both the canvas and the leather Ulitmates which I have been switching back and forth depending on my mood. I hope Grisko makes the Ultimate forever, they are my dream shoe! (since getting back to dance, I've ordered about a dozen different types of shoes, and have kept 6, thinking they were comfortable, but not knowing they didn't work for me until I danced in them! But the Griskos are my favorites! My second favorite is So Danca leather split sole). These look like very nice ballet slippers -- well made. Unfortunately, sizing seems to be very irregular. Some people say they run small, some large. We followed the guidelines for sizing using street shoe size and ordered both a half size and a full size up (based on reviews saying they ran small) and thinking the full size up would be a shoe she could grow in to. Both were much too small. In fact both the 6.5 and 7 seem to be the same length when compared to each other. These are so excellent. They last forever, even if you dance on not the best of floors. The shape is flattering to the foot and the color is nice, not obtrusive. The soles are great for balance and turning and never lumpy. The canvas is thick but soft, and molds perfectly to your feet. I wear a lot of different shoes and change them up depending on what surface I'm on and how my feet are feeling, but if I could only have one ballet shoe for the rest of my life, this would be the one. My dance teacher recommended that we (dancers) get canvas ballet slippers... I naturally went to Discount Dance and these were the shoes that caught my eye! The color is beautiful (a very pale pink similar to Grishko pointe shoe color) and the elastic matches perfectly! My feet are wide and flat, but my arches are pretty strong... these shoes show off what arch I have when on demi-pointe. While turning, the sole nearest the ball of the foot remains where it is supposed to be and doesn't slide around. Another pro is the size of the shoe, they fit my feet perfectly and they aren't too tight or loose. I have gotten so many compliments, everyone loves my shoes! Hopefully, you will as well! These are my favorite type of ballet shoes ever. They fit so perfectly, and look great too. I had them when I was really young, but then I lost them sadly. My friend gave me an extra pair of different shoes for now, and I've been wearing them since I've had these. When I need new shoes, I definitely want to buy these again. they felt so perfect on my feet, and I was so disappointed when I lost them. My only ballet slippers in the past have been leather split sole flats, and after finding that my toe felt too scrunched up in the top of my left foot, the insole becoming unglued, and after repeatedly sticking to the hot floor during class, I decided to opt for these. I'm so glad I did! These are great. Going to tendu or degage with canvas slippers is so much more pleasant, without that awkward sticky moment. Pirouettes are easier, and it's overall a better experience! Looking forward to the left one stretching out (I tried warm water on my toe or bunching up a sock to make it stretch, but no luck yet)! I WILL ALWAYS GET THESE! I really love this shoe size is great! I have narrow feet so I wish they came in width A! But I love these shoes so much. You should buy some I tried sansha pros and my elastic broke lasted 1 month and were gross and ripped! But with Grishkos I don't mind spending the money! So buy these they are worth it when these came in the mail I was so excited and these have beautiful color and are very pretty on my feet! The pinkness of them is spot on! BUY THEM!!!!!!!!!!!!!!!!! I decided to try these because of the previous reviews about comfort and the flat insole under the balls of the feet. I'm glad I did. These shoes have helped the pain in the balls of my feet when standing on demi-pointe. They mold to your feet really well and also hold up well. Most sole linings are just glued down and eventually wrinkle up and I end up pulling them out. These are sewn down. Problem solved! I have been wearing Grishko "ultimate" ballet shoes for the past 3 years and I love them. They shape to your feet really well which shows them off. If your looking for ballet shoe, this would be the one to buy. This shoe is my favorite canvas slipper I've owned. I wear a 9 street shoe and have a super-wide foot so I ordered the 9 D and they fit perfectly. My arch looks great in these, and I can turn even better now. These are great, and worth the money. I needed new shoes and decided to try canvas shoes instead of leather. These shoes look awesome on my feet - they show off the arch and a very nice vamp. They fit like a glove, and are wearing very well. I love the color since I usually wear very light pink colored tights. They are wearing very well so far...I take class twice per week. I highly recommend these shoes. Only Ballet Shoe To Own! PERFECT!!! I have owned many different kinds, styles, and fabrics. These are my absolute favorite. I have owned about six pairs now and just bought my 10 year old daughter her first pair. It was hard for me to find a shoe that would fit her foot. She wears a woman's size 9 wide. Grishko "Ultimate" had it and they were a perfect fit. I won't ever buy any other style. And the price is amazing. I hope they make this shoe forever, because I will always dance and will always need ballet shoes. I should buy them and give them away as stocking stuffers for all the girls at my studio. These shoes are great. The best part is the color. Some other canvas ballet shoes are too pink and it looks weird with light pink tights. But these are a soft pink so they look good with your tights. One thing with these is that they run small so order a half size up at least. Other than that they're great. This is my first ballet slipper and it fits so well, not tight anywhere, and it stays put! I wear a size 8 in slippers and usually 8.5 in street shoes. Very nice, soft pink color. Couldn't be more pleased with my first shoe. I just started using these shoes about a couple weeks ago and I love them! They are very comfortable and my feet don't hurt anymore like they used to, thanks to the padding on the heel! It gives me so much support. These shoes are made of some special type of material that won't rip easily. I recommend these shoes to people that need a lot of support on their heels! Excellent shoes. It's a pretty ballet shoe...it was really good except it was really square, so a little bit off for my tapered feet...these run small so order at least half a size up! For reference, I'm a 6.5/7 in street shoes and an 8W in Sansha pointe shoes and I ordered a 7C and it was the tiniest bit small. These are my favorite ballet shoes ever! I have been dancing since I was two and when I was little, I always just got regular leather ballet slippers. But as I got older, I realized how much my leather was bunching and it drove me nuts. So my teacher suggested canvas shoes, however my friends always told me they rip so easily that it isn't worth the money. I tried it out though and I absolutely love them! They fit like a glove, and there is virtually no bunching. It is so much more comfortable and I have only just recently had to buy a new pair after having my first pair of these for two years. Two years is a pretty long life for a canvas shoe and even after two years, they only have a hole in my big toe. I love these shoes and will never wear another ballet slipper! Wow! These shoes are great! I have these shoes and they are great! I love how they fit and feel. After this, I don't think I'll buy anything but canvas and split sole. They're wonderful for class, or even a performance! These shoes made it possible for me to enjoy ballet class again. I am an adult dancer who had an injury under the big toe, which ultimately required surgery. Other shoes with less generous soles and thicker stitching continually aggravated the injury site. This Grishko shoe has a wider sole and is lump free, so it allowed my foot to finally heal enough to achieve demi-pointe without pain. I love these shoes; they make the most of my shallow arches in addition to being the most comfortable I have found. These shoes are the best!! !They are very durable and extremely comfortable. My pair of these shoes have lasted well over a year! I've been dancing for 11+ years, and these are the best slippers out there. I bought two pairs, just in case, and I've been on my first pair for 6+ months! Grishko really is great! The shoes have no imperfections that I can see. I don't think anyone will be disappointed with this purchase. The shoes are also very durable. Everyone should buy these canvas ballet slippers. Love love love this shoe!I've been dancing for 15+ years and this is the most comfortable shoe. Dance clothes have come a long way in the past 20 years! Thank you Discount Dance - you're awesome!!! I love them! They are my second favorite brand (Sansha pro #1). When I had a foot injury, I had to try different brands of ballet flats and these seemed to work best on my injured foot. I like them because they have a v-vamp that fits my foot better than most shoes, even now that my heel injury has vanished! They last a long time also! I have had mine for 2 years now, and that is with teaching three days a week! These shoes are a good buy. But if you buy them make sure that you buy half a size smaller than street size because they stretch. Also they aren't the best for tapered toes (like me) because it bunches up. Besides that, these shoes are DA BOMB! They are very comfortable. When my foot is flat, it is a perfect fit. However, when I point my toes, the top of the shoe looks baggy. I wish they made these with a tapered toe. My favorite canvas flat! It forms to the feet well, and is not "bunchy" at all. Beautiful on the feet. I love this shoe!! It fits my long toes perfectly but the vamp is still low enough. It grips the floor well too. I do not know what each width option compares to...B,C,D does that equate to narrow, regular, wide width? how to order shoe size for Grishko ballet shoes? A womens street shoe size 9.5 medium. What size to order the Grisko ballet shoe? As per the manufacturer sizing recommendation you should order same as street shoe size. So if your street shoe is a 9.5 medium width then that would be a 9.5 C.
How to determine correct B, C, D sizing? I wear street shoe size 6.5 medium, and wear Jazz (Bloch) dance shoe size 6.5. I'm interested in purchasing Grishko's Ultimate split-sole ballet slipper in 6.5 size, but don't know which letter size to select: B, C, or D? Please advise. Thank you! What does B, C, and D mean? my street shoe size is 8, what would that be? The sizing suggestion is for women to order the same as street size. Men should order 2 sizes larger than street shoe size. Please note sizing cannot be guaranteed. Is the fitting for this the same as the Performance slipper? I wonder if it runs smaller because the Performance has elastic in the arch and this model doesn't. Yes, the sizing is the same for both slippers (true to street shoe size). Hi I am a 7.5 in a sansha canvas shoe what would i be in this? We actually prefer to size off of a street shoe as every dance shoe puts a conversion based on a street shoe. Do you know which style number of sansha shoe you have so we may be able to find the street shoe size? what would be a size for womens 7 street shoe? The sizing on this shoe states to order the same as street shoe size. What color tights are closer to the color of this shoe? Is the shoe color closer to ballet pink or just pink? My daughter wears 6.5 street shoe. size 5 eurpean bloch. What size do I order for these?